Hello lads and ladies I hope you're all ready for Christmas because I've got a fun and exciting tournament planned for you!! We will not have a member limit on this event, but if there's an odd number of players we will give some people byes into the next round, and those will be determined by random draw. How to play: Each matchup will be given the same Christmas puzzle, the person with the fastest completion time will move on and the loser eliminated. If you wish to enter just post below! The deadline for signing up is December 6th. Last edited by sexpot; 29-11-2018 at 10:18 PM. you make doing puzzles sound excited. Last edited by Sloths; 30-11-2018 at 03:30 AM. 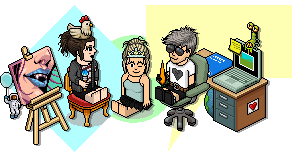 That'll be something, to see some of the habbox people thinking for the first time! !